In this 9-lesson series (each with two parts), many different aspects of the Christian life are looked at with grace being the ability to walk in them. Topics include: Healing, True Prosperity and Giving, Prayer, Righteousness, The New Creation Life (Spirit, Soul & Body), The Fruit of the Spirit, Operating in the Gifts of the Spirit, Accessing Grace by Faith. 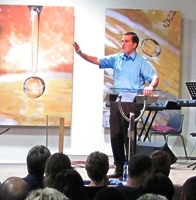 This 9-Lesson course was taught in South Africa in 2011. Each lesson contains two sessions for a total of 18 sessions. The Outlines are also available to the right of the media player.